On Tuesday 28 February a LISA (Leiden International Seminar on the Atlantic) will take place. 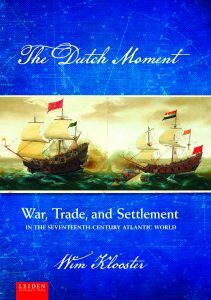 Wim Klooster (Clark University) will present his new book by giving a lecture titled “The Dutch Moment: War, Trade, and Settlement in the Seventeenth-Century Atlantic World”. In the seventeenth century, the Dutch built and eventually lost an Atlantic empire that stretched from the homeland in the United Provinces to the Hudson River and from Brazil and the Caribbean to the African Gold Coast. Unlike the contemporary Atlantic realms of France and England, that of the Dutch was empire forged on the battlefield. But how Dutch was it? Whether as settlers, sailors or soldiers, many participants in Dutch colonization came from other countries in Europe. Nor would the Dutch have been able to achieve military victories without the native alliances they carefully cultivated. Indeed, the Dutch Atlantic was quintessentially inter-imperial, multinational, and multiracial. After the lecture it will be possible to buy Wim Klooster’s new book with the same title for a discounted price of €32,50 (normally €39,50). The lecture will be followed by drinks. Attendance is free, but please register via j.j.s.van.den.tol@hum.leidenuniv.nl.